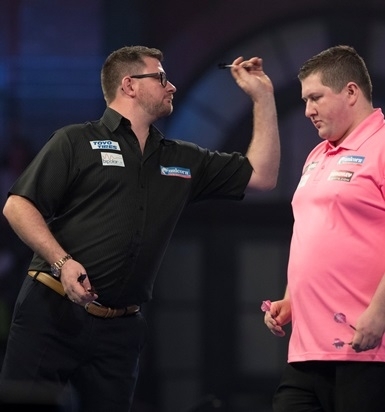 Hats off to James Wade! He produced a fabulous fight back to take out Keegan Brown 4-3 in yet another dramatic all-Unicorn World Championship clash on Sunday. Dobey will now face friend and mentor Gary Anderson in an all-Unicorn battle for a quarter-final place at the World Championship. But Wade was 0-2 and 1-3 down and also battling against the crowd on Sunday afternoon. Brown of course beat Wade at the Ally Pally 12 months ago and looked in control at 3-1 up. He won the fourth set without reply and was playing confidently. But Wade showed immense character to hit back and keep his dream alive. In the 6th set, Brown had the darts in a deciding leg. It was a thrill-a-minute contest. He was on 70 to win the match but Wade stepped up to hit a nerveless ‘tops’ for a 72 finish to make it three sets apiece. And it was ‘tops’ that saw Wade take control of the final set. He kept his composure throughout and won it in style with a brilliant 101 finish on D12 and he was through to a last 16 clash with Ryan Joyce after Christmas. Dobey yet again hit the heights when it really mattered. He banged in nine 180s in beating Van de Voort. Four sets, all won on throw, before the Dutchman broke to lead for the first time. However, Dobey was brilliant as he levelled the match without reply and it was a deciding set. 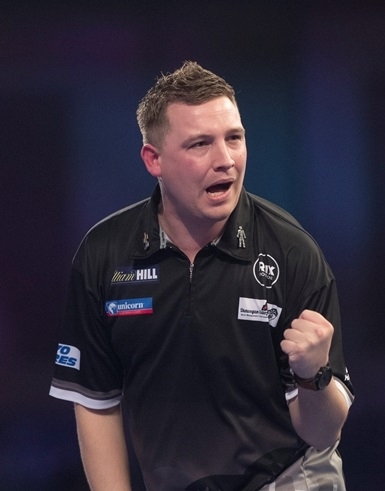 At one leg all, Dobey came up with back-to-back legs of 13 and 15 darts and he had done it. The biggest win of his life with an impressive 98 average over seven sets. “I can’t wait to play Gary. There will be some banter but this is serious business. It would be a dream for me,” Dobey said. But there was disappointment on Sunday for Team Unicorn’s Aussie Kyle Anderson who lost 4-1 to another youngster Nathan Aspinall. Kyle came up against an inspired opponent. Aspinall won a tight opening set in a deciding leg and went two clear with the help of 148 check-out. Anderson got in the game but Aspinall took his ton plus finish tally to four and continually hit the crucial doubles.